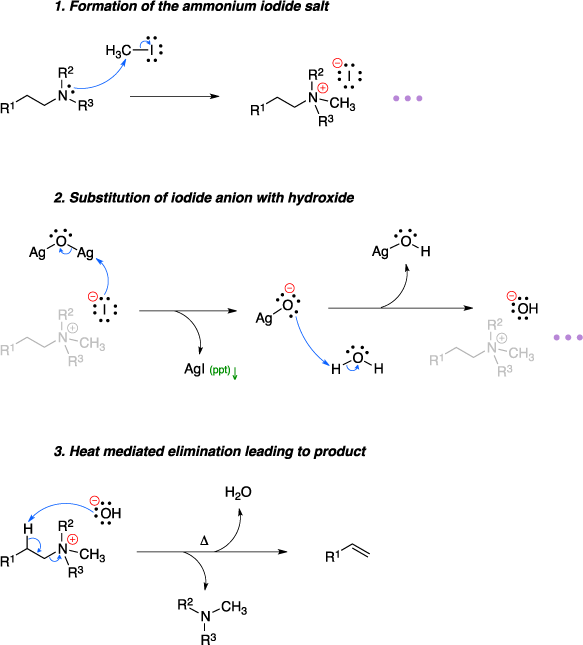 The Hofmann elimination is an organic reaction used to convert an amine with a β-hydrogen to an alkene using methyl iodide, silver oxide and water under thermal conditions. The mechanism begins with an attack of the amine on methyl iodide to form an ammonium iodide salt. The iodide then reacts with silver oxide to form silver iodide which is insoluble and precipitates out of solution and a silver oxide ion which deproto-nates water to form a hydroxide ion. Heating the mixture facilitates an elimination reaction where the hydroxide picks up the β-hydrogen from the ammonium ion and releases an amine to afford the final olefin product. Hofmann, A. W. Ann. Chem. Pharm. 1851, 78, 253–286. Hofmann, A. W. Ann. Chem. Pharm. 1851, 79, 11–39.